Here is a example of the use of the expression evaluator. As we see the expression evaluator takes a rule text and a object. In this case it is a person object with four properties. I use this properties in the rule text and the expression evaluator replaces the property name with the value of the overtaken object. That means that for the expression evaluator the rule text looks like ” (2 = 2 && true = true) || 36 > 36 “. Now the expression evaluator can evaluate that text and check if the expression is true or false. In this case it is true because 2 = 2 and true = true. The expression evaluator consist of four parts. The Lexer that reads every character, the Parser that builds the expression parts the infix to postfix converter and the evaluator that takes the expression parts and evaluates it to a specific result. I want to start with a description of the lexer. It is a so called LL(k) lexer that means it left associative and starts with the first left character. The k means how many character the lexer can look ahead. In this case it is only one character. Here is the class diagram of the lexer. In the Lexer class i have implementet the basis functionality for a LL(k) lexer. The ExpressionEvaluatorLexer class contains the specific implementation for the expression evaluator. The most importand part is the NextToken method that reads character after character and builds Tokens out of the characters. Here is the code for the NextToken method. As we see it is a loop that loops every character in the lookahead char array. If it finds a specific character for example a digit, the lexer assumes that it has an integer or an double. So i calls the Number method. The Number method tries to find out if the text is a integer or a double and it returns an integer or an double Token with the value it read. The lexer does this for every character and the parser controls the lexer and tells it to read the next token. That means the lexer does not read every character in the character array, it reads it token by token. If it has identified one token it returns the control back to the parser. 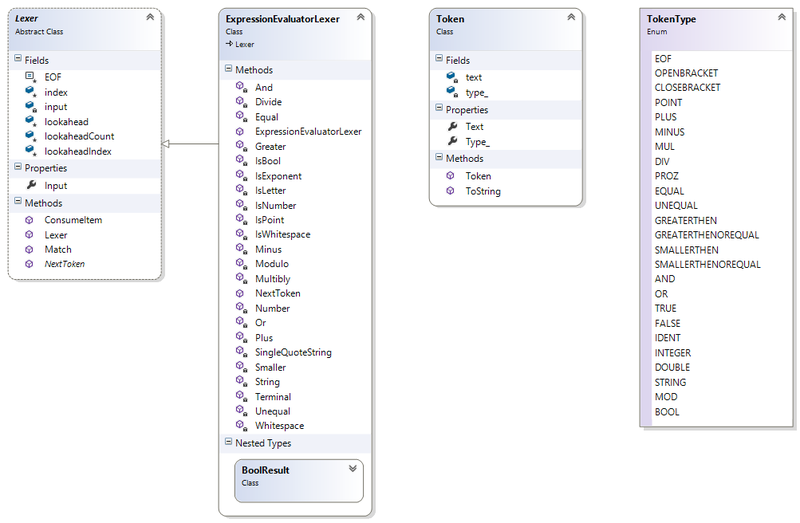 Here we see the class diagram of the parser. The ExpressionEvaluationParser reads the token from the lexer and builds a list of AbstractSyntaxTreeNodes. That nodes get rearranged by the InfixToPostfix class and then the result list is passed to the expression evaluator. That is necessary because the expression evaluator can handle operator precedence, that means that a multiblication is performed before and addition or substraction and that calculations are performed before comparison operations. That is the parser code that perfoms the transformation from the tokens to the AbstractSyntaxTreeNodes. That means if it finds an Eqaul token it builds a EqualNode and consumes the next token, if it finds a Integer token it overtakes the value of the Integer, builds a IntegerNode with the overtaken value and consumes the next token with the match methode. The parser has a tranformation method for every token. We now have a list of AbstrancSyntaxTreeNodes that represent the overtaken text. After that we have to get the AbstractSyntaxTreeNodes in the correct order to handle operator precedence and open and closed brackets. The best way to do that is to convert the expression that is defined in infix into a postfix expression. The benefit of a postfix operation is that it is much easier to evaluate than an infix expression. All we need for the infix to postfix transformation is an operator stack. I will show an example for the transformation of a list of infix operations to a list of postfix operations. We start with the expression 5 + 3 * 2 – 1. To convert that infix expression to a postfix expression we take every part of the expression and tranform it. We need a stack for the operator precedence and a list that contains the postfix expressions after the transformation. Now we have one big benefit, we can take that list and evaluate it from the beginning to the end without mind of the operator precedence. But what is if we have brackets in out expression for example the expression ( 5 + 3 ) * 2. We can handle that also very easily. As we see all brackets are gone and if we use postfix we dont need them anymore, if we evaluate that expression we can calculate the right result without any brackets. What we now need to do is do define the operator precedence for all operators. That is necessary because at first the expression evaluator has to perform calculations (multiblication, division and modulo before addition and subtraction) then the expression evaluator has to check for comparison ( equal, unequal, greater than, smaller than). After he evaluated this it has to check for logical combinators (logical and, logical or). So that is the operator precedence of the expression evaluator. Here is the code for the ConvertInfixToPostfix expression that performs exact that transformation from an infix to a postfix expression. Now we can take the result from the Stack ( 10 ) => that is the result. 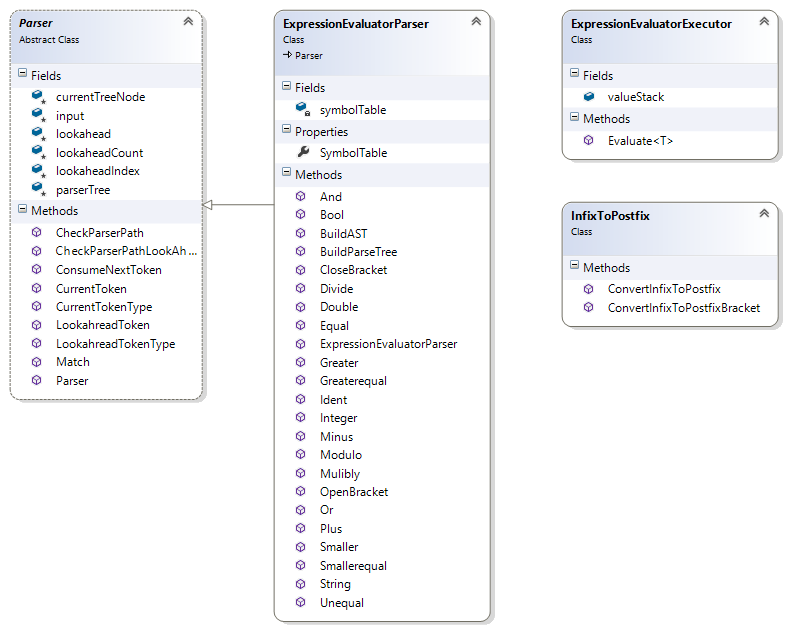 Here is the code that shows the Evaluate method that takes the list of the AbstractSyntaxTreeNode and evaluates them. The evaluator part is really easy, it uses on stack for the values and the calculation results. So it takes on AbstractSyntaxTreeNode after the other and if it is data it puts it to the stack, if it is an operator it performs the operation and puts the result to the stack. If it gets the following postfixlist ( IntegerNode(4), IntegerNode(5), IntegerNode(3), MulNode(*),AddNode(+)) it starts with pushing 4 to the stack, pushing 5 to the stack, pushing 3 to the stack. Poping 3 and 5 from the stack perform the multiblication and push 15 to the stack. Then it pops 15 and 4 from the stack, performs the addition and pushes 19 to the stack. So the result would be 15. The problem is that the Evaluate methode returns bool. That is because the expression evaluator can only perform expression the have true or false as result. So if you evaluate ( 4 + 5 * 3 ) you get an exception. You have to write ( 4 + 5 * 3 = 19 ) that is a correct expression that returns true or false. The expression evaluator was written to perform rules against the properties of objects (building a rule engine in c# (part 4: extending the rule engine to evaluate defined expressions)) and a rule has to return always true or false. You can download the source code from http://simpleexpeval.codeplex.com/.